Portrait bi Albrecht Dürer, 1519 (Kunsthistorisches Museum, Vienna). Maximilian haulds his personal emblem, the pomegranate. 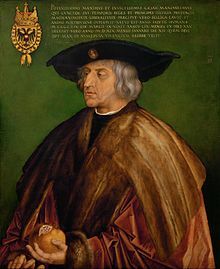 Maximilian I (22 Mairch 1459 – 12 Januar 1519), the son o Frederick III, Haly Roman Emperor, an Eleanor o Portugal, wis Keeng o the Romans (an aa kent as Keeng o the Germans) frae 1486 an Haly Roman Emperor frae 1508 till his daith, thou he wis never in fact crouned bi the Pape, the journey tae Roum always bein too risky.